OVCS freshman Maison Gruber (32) hauls in a rebound during a Dec. 18, 2018, girls basketball contest against South Gallia in Mercerville, Ohio. PARKERSBURG, W.Va. — It must have been some halftime speech. 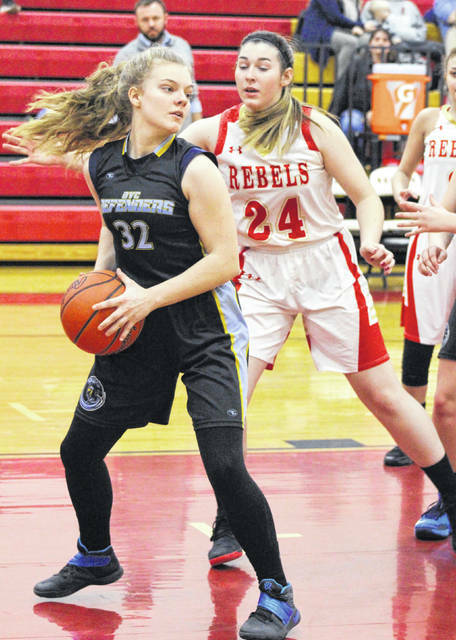 The Ohio Valley Christian girls basketball team opened up an eight-point halftime advantage with a pivotal 24-4 third quarter surge and ultimately rolled to a convincing 41-17 victory over host Parkersburg Christian on Monday night in a non-conference matchup in Wood County. The Lady Defenders (7-8) had some offensive struggles in the first half as the guests mustered a 4-2 advantage through eight minutes of play, then made an 8-2 second quarter run en route to claiming a 12-4 cushion at the break. OVCS, however, had the flood gates open in the third stanza as the Blue and Gold had six different players score at least one basket during a 24-4 charge that increased the lead out to 36-8 headed into the finale. Emily Childers and Leticia Araujo respectively contributed seven and six points during that frame, plus four other Lady Defenders combined for 11 points in helping OVCS build a 28-point cushion. Ohio Valley Christian was outscored by a 9-5 margin down the stretch, but still had more than enough breathing room to wrap up the 24-point triumph. The guests connected on 19-of-74 field goal attempts for 26 percent, including a 3-of-11 effort from behind the arc for 27 percent. The Lady Defenders were also 0-for-9 at the free throw line. Childers led OVCS with a game-high 16 points, followed by Araujo with 10 points and Chloe Payne with six markers a team-best nine rebounds. Kristen Durst was next with four points, with Maison Gruber and Lauren Ragan completing the winning tally with three and two points respectively. Childers followed Payne with seven caroms, while Ragan added four boards. Durst also dished out a team-high three assists. OVCS hauled in 24 rebounds and committed only seven turnovers. Parkersburg Christian made seven total field goals — including zero trifectas — and also went 3-of-6 at the charity stripe for 50 percent. LouMasi Lott paced the hosts with eight points, followed by Courtney Cline with five points and Willow Walker with four markers. Ohio Valley Christian returns to action Friday when it travels to Teays Valley Christian for a 6 p.m. tipoff.